Vintage watches tend to be smaller and thinner. Anything ever caught your eye? I wear my Seiko Chariot quite often for dress up and it's ultra slim so no problem at all slipping it under a cuff. WatchChat on Facebook - A relaxed and laid back group of watch enthusiasts chatting about watches and whatever else happens to come up. I'd buy a plain black dial Skagen. I have 1 as my dress watch, no numbers, thin markers and hands. Looked great last time I wore it with formal evening suit at New Year. Yes they're quartz but very slim, loads of choice, about £100. If you're not wearing it much why pay out more. I think your right on the cost front. The C1 GMPR is a beautiful watch but im struggling to justify a £1000+ watch that i rarely wear. Even with the suggested new shirts it wouldnt get worn much as i have other watches i wear daily. ^^^^ I think the 595 would be great for you. That is very nice, classic clean and simple design. looks very thin too. In a meeting with lawyer recently, he was wearing smart dress watch I was quite taken with. It was a Junghans Max Bill (do auto and quartz/black or white face/10mm ish) which can be had for CW type money especially nearly new. Elegant but interesting... Sorry to suggest a non CW in this thread. CW's: C30, C60 Orange bezel, C9 Harrison Chrono (big blue) LE, Harrison C9 date, C70 MC, C7 Chrono. A good alternative to the JLC would be the Montblanc Chronometrie Ultraslim ref 112515. The 38mm no date pictured is now discontinued but often comes up for sale lightly used at just over $1,000. The replacement version has the date at 6 and is ref 112533 on strap /112532 on bracelet. 40mm wide and 7.65mm tall. 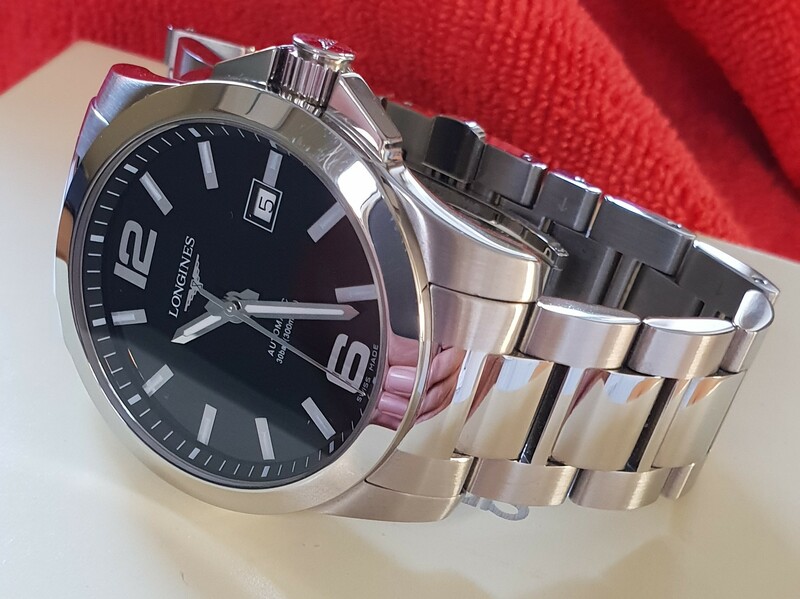 Have you considered a Longines Conquest automatic. Relatively thin, and the bezel helps it slips under cuffs, its a dress diver, so quite sturdy to boot. The one pictured is my black face version, it also comes with silver dail. I agree with all of my above comments. Little update for anyone that's interested. The C1 has been sold .....to a forum member which is nice. I'm returning the 2 CW watches and keeping the uniform wares C40 for now. Going forward i'm keeping an eye out for a 595 and also the Montblanc shown above. Thanks everyone for their input it was much appreciated. I'm thinking the same thing re getting a dress watch. I think the old C9 does it for me. This is kind of stupid but how do I access the nearly new section on the website? Welcome. There is nothing in the NN section at the moment apart from straps. However, you would be most unlikely to find a C9 Harrison there as they haven’t been made for years. The half minute which we daily devote to the winding-up of our watches is an exertion of labour almost insensible; yet, by the aid of a few wheels, its effect is spread over the whole twenty-four hours. This will be my dress watch for the time being- ETA automatic movement, exhibition caseback, less than $300 USD from Jomashop. That's pretty and appears to be quite a deal. How is the case & clasp quality? I do appreciate a sub seconds for a dress watch. Not too bad at all. The case sides are polished and top surfaces of the lugs are brushed to a good standard. The hour markers have polished bevel facets which catch the light nicely and the wave guilloche on the dial is very nicely done indeed- the waves producing nice patterning which vary with orientation. I'm not a fan of butterfly clasps, and this is no exception, but at least it's polished well and doesn't have any 'slop' in the linkage. The caseback is pushfit where I'd have preferred a screw-down but still alleged to be 100m resistant. The thin application of lume on the hour markers and hands is a bit rubbish. The crown is also small and polished and the action quite stiff, so not easy to turn- but you only need 5 or so turns to get the watch ticking and away and ready to wear. All in, good looking, goes well with smart office wear as well as, surprisingly, a casual shirt and jeans. Definitely one of the best value watches I've bought in a long time.